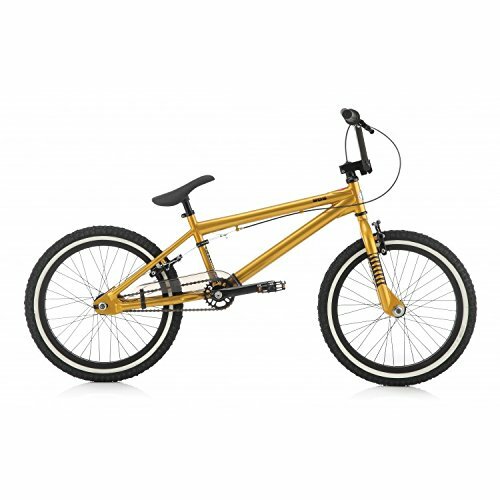 Python 90s 20” Gold BMX Bike is a unisex children BMX bike with an amazing outlook that is well fitted for both rough and normal cycles. This is an absolutely rugged bicycle fabricated with a long lasting hi-tensile steel frame that guarantees protection and relaxation for all young children. 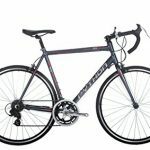 The tough steel frame ensures rigidity and resistant for all stunts cycling adventures. All courageous young children enjoy cycling with this bike and become so attached to it because of the great fun they derive from it. This will certainly captivate the heart of your child after riding for a week at most – he/she will dream about cycling even while asleep at nights – it that addictive. The Python 90s 20” Gold BMX Bike is made for children, therefore it features an oversized strong hi-tensile tubing frame coupled with oversized hi-tensile fork as well. With these mentioned components it is comfortable for the young child to move easily on hilly and plane terrains. Protection, ease and durability is assured during this cycling sport for all little athletes in the making. The bike comes with comfortable BMX handlebars, certifying the safety of your child’s hands. This is because it is rightly positioned for your little one’s hand to hold on to accurately without any stress or strain. Your precious little child protection and comfort is of great importance to the manufacturers of this bicycle, that is why they carefully and strategically placed every component to certify this. 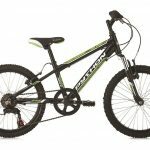 This product also features accurate Promax alloy U-brakes to securely stop movement when your child applies it while cycling. This is very vital and quite reassuring. It has 20 black alloy rims wheels with white wall tyres that ensures a rigid grip to the ground while the youngster cycles. You will also find a 3 piece crank chainset amongst the components of this bike. With extra free stunt materials like a pair of axie pegs for your kid to play with while he cycles too. Python 90s 20” Gold BMX Bike has a weight of 13.7kg which is light enough for the strong little child to lift easily out of the house for his playtime and back when through. It is not funny at all to have your child carry a bike that is weighing more, exactly, or half his weight. That is why it is necessary to check the weight of the bicycle, comparing it with your kid’s weight before buying. The Python 90s 20” Gold BMX Bike is truly an extraordinary cycle that provides protection, unlimited enjoyment and comfort all bundled up in one experience for all children around the world. This bike was designed to be comfortable for every child because of its adjustable features that makes it fitting for most height specifications. The body build and all components were carefully put together precisely without error or defects. A compact exterior is achieved when all components are assembled together. If you buy this product it comes 90 percent assembled, very easy for anyone to unload and couple the remaining parts without many hassles. All that is required is the instruction set that contains all the required processes for final assembly. However if you cannot handle it, a local technician can help with it. Most customers say it was not difficult at all to finally couple the remaining parts when the package was delivered. This is because the greater part of the assembling work has already been done from the factory up to 90 percent before shipping. The coupling work left is just about 10 percent at most. Owing to the strong and durable hi-tensile frame of the Python 90s 20” Gold BMX Bike longevity is guaranteed. The roughness of your child’s cycling will no longer border you because he/she is using a trustworthy brand like Python. With great balance, this bike will surely keep the little rider steady on all terrains. The fabulous Python stunt bike, with perfectly designed features provides memorable, excitement-filled sporting for your little athlete in the making. Let the fun Begin! Yes, this Python unisex children’s bike has a freewheeling system. It weighs 13.70kg. It is a good lightweight bike very comfortable for carriage. Does it come completely assembled? It is 90 percent almost completely assembled from the factory. You will have to do the remaining coupling which is easy by the way. Of course, handlebars, seat post and other parts can be adjusted to accommodate your child’s growth. Check out our guide on Kryptonite bike locks. It comprises of a sturdy oversized hi-tensile frame that is long lasting and can be adjusted to fit the child’s height per time, providing profound enjoyment and comfort every time the child rides. This Python BMX bike was specially designed as a pavement bicycle for all children across the globe. It provides exploratory stunt cycling escapades for your little dare devil with the included free axie pegs.